(Photo: REUTERS / Marie Vanover /U.S. 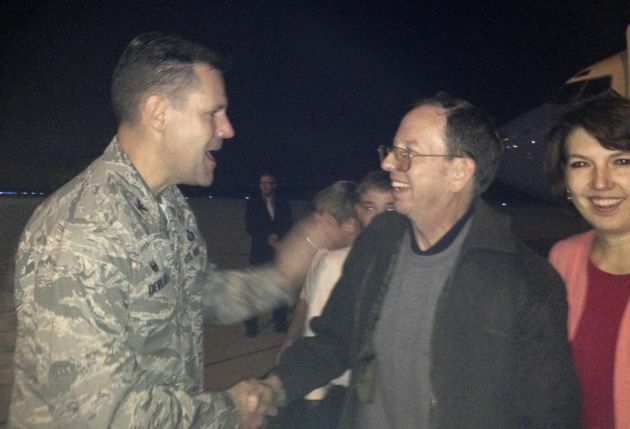 Air Force / Handout)Jeffrey Fowle (C) and his wife Tatyana (R), are greeted by U.S. Air Force 88 Air Base Wing Commander Col. John Devillier upon arrival at Wright-Patterson Air Force Base in Ohio early October 22, 2014. Fowle has returned to his home in southern Ohio after his release from North Korea, where he was treated well while in captivity, his lawyer said. Jeffrey Fowle, the American Christian who was detained in North Korea for his faith, has said he intentionally left his Bible in a nightclub. Fowle was detained for six months after North Korean authorities discovered a Bible with his name in it under a trash can in the washroom of the nightclub. He entered the country on a tourist visa but with the agenda of helping the underground churches there. He told ABC News on November 2 that he was motivated with the stories of persecution in the country making him want to go. "I had brought an English-Korean Bible with me on the tour with the hopes of getting it into the hands of the underground Christian Church," he explained to Christian Broadcasting Network. He knew that what he did was against the law but said that he was just trying to fulfill the Great Commission of Jesus to share the good news to the nations. Christianity is regulated in North Korea and those caught with a Bible can be sent to a labor camp, together with members of their family. Surprisingly, Fowle said he was treated well during his detention. He stayed in a luxury hotel and was given three meals a day. This is different from other two Americans, Matthew Miller and Christian missionary Kenneth Bae, who are still in North Korea and are sentenced to hard labor. Fowle said he regrets doing the "secret mission" and thought of the harm that could come to his family if he had been detained for years. "I don't recommend anybody sneaking across the border with a sack full of Bibles or tracts," Fowle said in his interview with ABC News. "They're serious about their anti-religion in the DPRK."